Our continuous research and market-sizing reports follow a rigorous methodology under which we map the entire enterprise software market by functional area, vertical industry as well as deployment method. Additionally, we break down discrete markets like Human Capital Management into more descriptive segments in order to help buyers explore the sum as well as its moving parts. What follows is the taxonomy that we keep updating on a regular basis by constantly factoring in innovative technologies and new business models. In our vendor database, there are more than 3,000 vendors that offer enterprise applications for different functions and verticals. Data used in research reports are derived from publicly available documents, continuous surveys of applications vendors, customers, resellers, Independent Software Vendors, systems integrators and other verifiable sources. Each year we conduct an annual survey that covers the latest financial results of these 3,000+ vendors by product, function, vertical, and country. Then we create a company model for each of them to determine their revenues as the basis of their profiles. Before we publish these profiles, each of these vendors receives a draft so that they can offer us their input, feedback and revenue guidance. Publicly-available information from third-party sources such as newspapers, blogs, social media, etc. Finally, vendor shares and market forecast results are based on a combination of existing databases as well as demand side and supply side research conducted throughout the year with validation from vendors, customers, channel partners and documentations such as earnings releases and 10Q and 10K filings, vertical industry studies, regional and country-level statistics from public and private institutions(i.e. colleges, universities, government agencies and trade associations). Enterprise Applications cover 16 functional areas from analytics to treasury and risk management, in addition to those designed for 21 verticals from aerospace to utilities. Cloud Applications cover those that are primarily delivered via public Cloud. Non-Cloud Applications are those that are typically installed behind the corporate firewall. Enterprise applications are derived from more than three dozen functional markets and vertical industries by automating specific and discrete business processes and functions generally used by a customer either within an enterprise or across multiple divisions of a vertical industry. The associated product revenues(license, maintenance and subscription) form the basis of enterprise applications market sizing. Because of their ease of use and deployment via the Cloud, the enterprise applications market is expected to remain one of the fastest-growing segments of the enterprise software space(which includes infrastructure, systems management, integration, and other packaged products like databases). Knowledge transfer plays a key role in the Collaboration application market especially when it comes to adding value to Electronic Performance Support Systems(EPSS), which enable companies to better prepare and train employees and users with online guides in order to help them complete specific tasks and business processes. Next-generation EPSS can fill the gaps of the team and unstructured collaboration, making intranets, project management, and other knowledge management tools more accessible. ERP Services and Operations Management ERP Services and Operations Management covers integrated applications suites designed to automate a range of business processes from back-office operations to financial management and from sales order capture to customer information management. 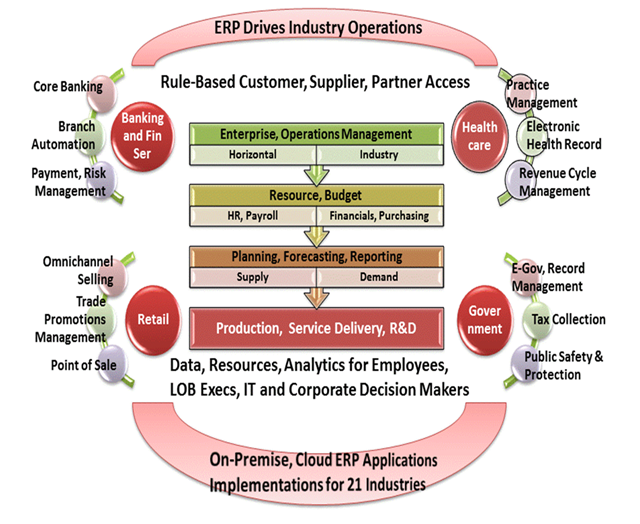 Currently, ERP also covers functions not being addressed by other functional markets. Examples include Environment and Health and Safety, Governance, Risk and Compliance, as well as industry-specific applications for 21 verticals. IT Service Management ITSM applications are being used to make a growing number of employee self-service functions possible through enterprise service management for an asset, incident and project management. ITSM applications are considered a derivative market with revenue contribution to functional areas such as Project and Portfolio Management and Enterprise Resource Planning. Product LifeCycle Management and Engineering Product Lifecycle Management applications enable key stakeholders including designers, engineers and OEMs to gain and optimize visibility into the entire product lifecycle from idea generation to collaboration and from product data management to iterative development efforts. PLM applications are considered a derivative market with revenue contribution to functional areas such as Project and Portfolio Management, Enterprise Resource Planning and Manufacturing. Treasury and Risk Management Treasury and Risk Management applications cover standalone and/or integrated products that automate business processes to support corporate treasury operations (including the treasuries of financial services enterprises) with the corresponding financial institution functionality and optimize related cash management, deal management, and risk management functions. Performance and Goal Management HR performance management applications are designed to automate the aggregation and delivery of information pertinent to the linking of job roles and the mission and goals of the organization. More specifically, the system allows users to automate the performance review process by using mechanisms such as training and key performance indicators to continuously track and monitor the progress of an individual employee, work team, and division. Some of the key features include Assessment of individual career objectives and organizational skills gaps that impede performance and job advancement. Continuous reviews and establishing milestones. 360-degree evaluation and real-time feedback. Performance appraisal automation. Goal setting and tracking. Employee surveys. Alignment of human assets to corporate objectives. Fast tracks for top performers. Absence and Leave Management Absence management applications offer automated features to support employee leave management, employer-authorized leave, Short-Term-Disability/Workers’ Comp coordination, federal and state compliance, customized leave correspondence, medical certification processing, insurance premium payment tracking as well as employee self-service capabilities. Leave Management supports compliance activities related to government regulations such as the Family and Medical Leave Act in the United States and other local leave laws in different countries. Time and Attendance Time and Attendance applications are designed to automate employee time tracking in different locations, help reduce overtime expenses, improve payroll accuracy, eliminate pay errors and adjustments, along with the need to simplify and optimize administrative tasks and complex rate calculations by making available accurate and current labor data and full audit trail of payroll data.